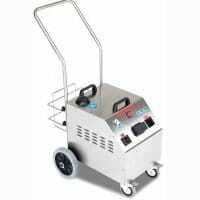 A cleaning machine for both commercial and industrial jobs, making light work of the toughest cleaning tasks. Dissolves grease and grime with the minimum use of chemicals & detergents saving you time and money. The continuous refilling system means that you don’t need to wait for the machine to cool down before refilling, making it ideal to use for long periods. The machines high temperature and powerful pressure make easy work of any dirt, grease, oil or even carbon build-up. The smallest of spaces can be thoroughly cleaned. Large selection of different tools & optional accessories available – a very versatile machine. Suggested uses – commercial kitchens, workshops, hospitals, manufacturing lines & much more. It will clean ovens, kitchen walls, floors, sinks, interior & exterior of fridges, freezers defrosted & sanitised.